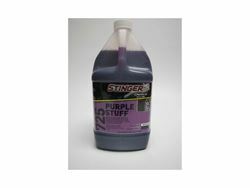 Stinger Purple Stuff Degreaser is an economical, high alkaline, high foaming degreaser for quickly removing grease, oil, dirt and road grime. Can be diluted up to 1:5. Available in gallons, 5 gallon, 30 gallon and 55 gallon sizes.